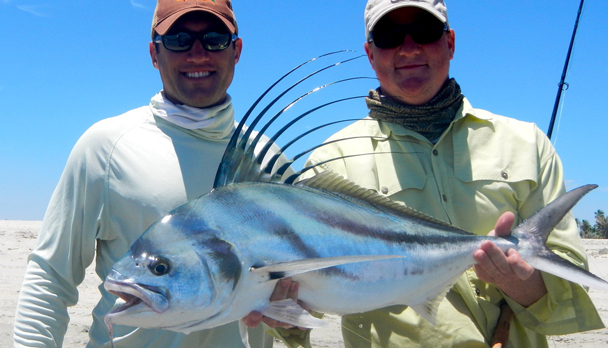 Our fly fishing guide service for Roosterfish, Dorado, Yelowfin Tuna, Bonito, Billfish, is located at the southern tip of Baja California known as East Cape. We offer a host of fly fishing packages and services that can be specifically tailored to any desire. Baja coastline, located at the southern tip of Baja California known as East Cape, is known for its unique beach fly fishing conditions and roosterfish populations. East Cape is on the Sea of Cortez side of the peninsula, hour north of the famed resort town of Cabo San Lucas. The protected waters of the Sea of Cortez are typically a much calmer nautical experience than fishing the offshore waters of the Pacific or Atlantic oceans. We offer a host of fly fishing packages and services that can be specifically tailored to any desire. Cabo San Lucas offers world class off shore and inshore fishing opportunities. One of the advantages of fishing the offshore waters of Cabo San Lucas is that you not need to travel very far offshore to fish these productive fishing grounds. Marlin, dorado and yellowfin tuna are just a few of the fish species that can be caught in the offshore waters of Cabo San Lucas. 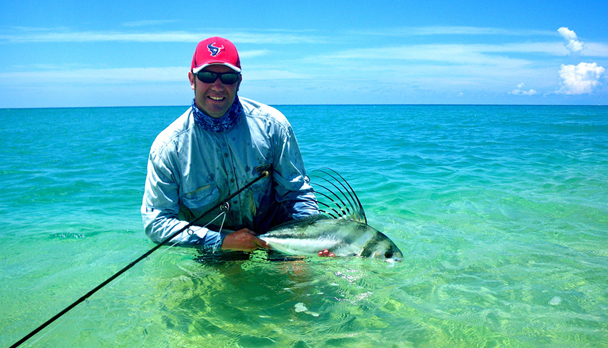 The inshore waters of Cabo offer spectacular fishing opportunities for roosterfish, sierra, pompano, pargo and a variety of other inshore fish species. Best fishing is in spring period, from April to June/July. Day 1: Fly into San Jose de Cabo. An air-conditioned van will greet you and drive you north about 45 minutes to the beach house front door. Appetizers and drinks will be waiting and you are welcome to fish the beach. An authentic Mexican meal will be served at sunset and the guides will give you the game plan for the next morning. Days 2 to 5: Full fishing days. Day 6: Transfer back to the airport of Los Cabos. A gorgeous beach front ocean villa "Casa Laguna" in La Capilla, a 10 minute drive from Los Barriles, on one of the East Cape's most scenic beaches. The house features, 4 double bedrooms, 2 bathroom units, perfect for couples, or groups of up to 8 people. Fish, paddle board, kayak, or kiteboard right outside your door. Then relax on the patio or roof with a tropical drink whale watching, or having a bonfire under the stars. Fly Rods: 9' and designed for saltwater; a # 8 or # 9 Wt (beach, inshore for medium sized species to twenty pounds); a # 10 Wt (inshore and offshore for dorado, jack crevalle, bonito and some tuna), and a # 12 Wt for larger dorado and billfish species. Fly Reels: should be matched to rods in weight and line capacity. Reels need to be saltwater quality with high performance drag features. All reels should have a minimum of 250 yards of 20 or 30 pound backing. Fly Lines: Shooting head lines are utilized a majority of the time in our fly fishing pursuits. Integrated shooting head lines seamlessly mated to neutrally buoyant running lines cast and fish the best. One reel or spool with a floating line is a good thing to bring as well. When the dorado bite is really hot it is spine tingling to cast a popper on a floating line to boiling dorado. Flies: Choosing flies for any trip is half the fun of the journey. 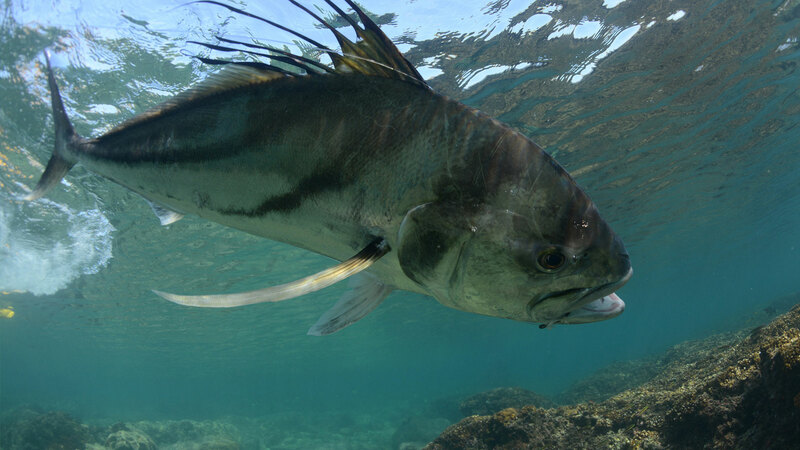 Baja, Mexico saltwater fish are not extremely different from similar species around the globe. The standard tried and true baitfish fly patterns work well such as: large clousers, deceivers and others. There are East Cape patterns and variations that have been developed for fly fishing the area. Flies should range from size 4 for beach fishing up to 4/0 for offshore fishing. Fly Fishing Accessories: Stripping basket; waist or chest pack for beach fishing; polarized sunglasses; hat; hook sharpener; fishing pliers; leader material ; extra fly lines-two of the most common sizes; leader material-12 lb, 16 lb, 20 lb, 30 lb, 40 lb and 100 lb. ; smaller sizes in Fluorocarbon; sunscreen 30 or more SPF; camera-extra batteries, film or digital storage cards; stripping fingers. Rates include: Transfer airport/lodge/airport, 5 full fishing days, 6 night-accommodation, all meals and beverages, fishing license, skiff and bilingual guide. Rates do not include: International flights, health insurance, personal expenses, fishing equipement and flies, gratuities. After returning from our trip to Rancho Leonero in Baja California, I�d like to let you know that everything turned out marvelously and we were delighted with the place. We had a very positive experience. The ranch is located in a beautiful place, right on the beach. The rooms are spacious and fully-equipped. The food was quite good and in general the people were very nice. The fishing is done on well-equipped pangas, which proved to be very comfortable for fishing. The fishing was quite slow; maybe because there was full moon almost every day. However, we fished very well and we could test our tackle on tuna and dorados. Rooster fishing is absolutely amazing and technical. What�s more, and despite my belief, there�s plenty of Rooster in this area so there are high chances of catching one.